Many gold pundits have dismissed Bitcoin as simply inferior to physical gold. “Gold is everything that Bitcoin is, and even more,” they tell us, “so why use Bitcoin?” Their analysis seems superficial, focusing on things such as (the lack of) physical-backing and the sheer limits of the quantity of gold or Bitcoins that can ever be mined. But perhaps the “gold-bitcoin divide” is a false dilemma. What if physical gold, as well as Bitcoins, have their specific pros and cons? Let’s go and dissect the arguments. Many Bitcoin-opponents argue that there is only one way in which money comes into existence: first it has to have “commodity value” and only then can a good attain “monetary” value. This wonderful thesis was first proposed by Austrian economist Carl Menger in his “On the Origin of Money”. The problem? It’s not in any way universal (something Menger himself would readily admit): it’s not the only way in which money comes into existence. Money has come into existence in a myriad of other ways: by government fiat (whether we like it or not) or, in the case of Bitcoin, by the mere goodwill of a minority of innovators. The argument that Bitcoins have no “underlying” value is true, however, to some extent; Bitcoin is more likely to go to zero than gold. A good friend and Bitcoin-expert even argued that “Bitcoin goes either to the moon or to zero”: yet this doesn’t imply that a lack of prior “commodity value” is an impediment to a more widespread adoption of Bitcoins. The story of James Howells is sad yet hilarious. He was one of the first “miners” of Bitcoins when it was still easy and cheap. In less than a week he mined 7,500 Bitcoins. Then his girlfriend complained about the noise of the continuously running laptop and he stopped mining. Gradually, he forgot about his Bitcoins, while he had his cryptographic “private key” to access his bitcoin wallet saved on his hard drive. After spilling lemonade over his laptop, he turned his computers into pieces and eventually ditched them all after a clean-up. Now his Bitcoins are worth over $6 million. But they’re gone, buried under a pile of rubbish in the local junkyard, with little hope of ever recovering them. Mr Howells is not alone; Bitcoins do vanish so now and then. So the theory is that, as wallets get lost over time, all Bitcoins will disappear in the vast emptiness of cyber space, leading to the eventual destruction of Bitcoin Inc. Yet this doesn’t really matter; Bitcoins are almost infinitely divisible. They even already gave it a name: 0.00000001 BTC equals 1 Satoshi, 0.000001 BTC equals 1 microbitcoin (one “mike”). 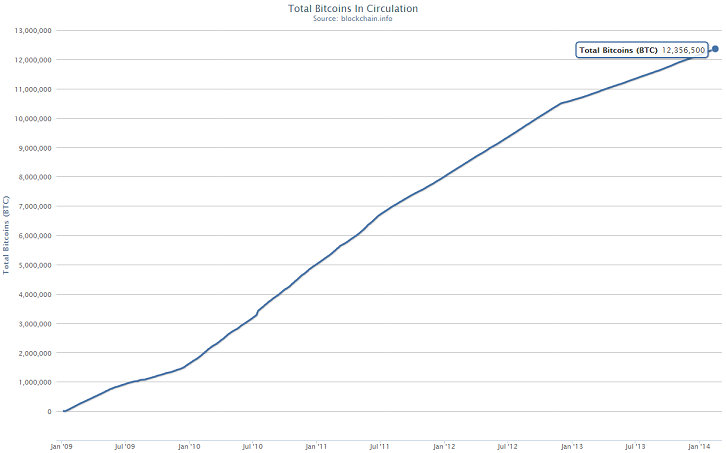 And as a few Bitcoins disappear, an increase in value incentivizes holders to sell “idle” Bitcoins. Argument #3: The Supply of Both Bitcoins and Gold Is Limited: So Why Use Bitcoins? This argument seems to miss the entire point. Bitcoins have certain qualities that distinguish it from gold. They are not the same, although they share some common ground (limited supply, decentralized). Even the well-appreciated Jim Grant resorted to this argument as he stated: “Gold is nature's Bitcoin.” Well, gold is not. They are similar and complementary, but inherently different. First, Bitcoins are easier to use in cross-border transactions; bits and bytes pass international borders easier than bars of gold. Second, for now it seems impossible to prohibit Bitcoins entirely; at the same time gold supply is severely curtailed in nations as India, Argentina and Venezuela. Third, Bitcoin supply currently increases at a rate of over 10% per year. Estimates say supply growth drops a 50% every four years. With over 12 million of roughly 21 million Bitcoins already mined, we can still expect some dilution. In contrast, gold mining adds approximately one to two percent to total gold supply each year. Fourth, Bitcoin can be used as a medium of exchange at over 700,000 retail outlets in the US alone, but gold is the currency of central banks. Fifth, by storing gold safely you incur fees (in GoldRepublic’s high-security vaults or even at home, assuming you want to be protected against theft by insurance), with Bitcoins you do not. Sixth, governments can easily restrict the access to the internet by taking ISPs offline, however big a hurdle it might seem. Seventh, Bitcoin is like a framework with which there is a lot of innovation possible to make Bitcoin more anonymous and privacy-protective. Am I saying that Bitcoin is better than gold? No, just that it’s different. When To Buy Gold and When To Buy Bitcoins? There’s not really a “gold-bitcoin divide”. Bitcoin is speculative; its success depends on increasing adoption and many uncertain factors that gold has outgrown long ago. Although government debts still increase and central banks have no other choice than to continue their reckless policies, Bitcoins might as well be worth nada in a few years. Therefore, the question remains whether Bitcoin will endure; buying Bitcoins seems to be an “all-in” in poker terms. In contrast, gold has a long track-record. We could count on “the Lindy effect”; a term coined by Nassim Taleb, which explains that because gold has been used for 3,500 years as a medium of exchange, it is likely that it will endure another 3,500 years. Of course, mathematically the theory doesn’t make much sense (every additional day increases the life expectancy with yet another day), but intuitively it does. Gold is not about to vanish tomorrow. As such, gold — in one way or another — is a necessary part of everyone’s investment portfolio. It serves an important function — it’s a hedge against central banking stupidity — and doesn’t come with the potential downside of a speculation in Bitcoins. Bitcoins, however, seem to have more potential upside if and only if it endures.